Before learning how to bake a ham, it is important to know the different types of ham. Most hams come from the hind leg of a hog; however, some like the picnic ham comes from the shoulder of the pig. Hams can be purchased with the bone in or boneless. This too affects the cooking of the ham so check cooking ham instructions. Baked ham makes great leftover ham recipes. Some consider a fresh ham or uncured ham simply a pork roast because it has no curing process involved. Besides roasting, this ham can be sliced, sawing through the bone to make pork steaks(Ham Steak). It can also be boned and made into smaller boneless roast or made into fresh ground pork. To know how to bake a ham, know that most hams purchased in the grocery stores in the United States are quick cure hams. They are cured with a brine made with a product such as Tender Quick. These hams require no soaking or precooking and they require a shorter roasting period than the old style cured hams or home style cured hams. Place the ham on a rack in a shallow roasting pan in the oven and follow the package directions. 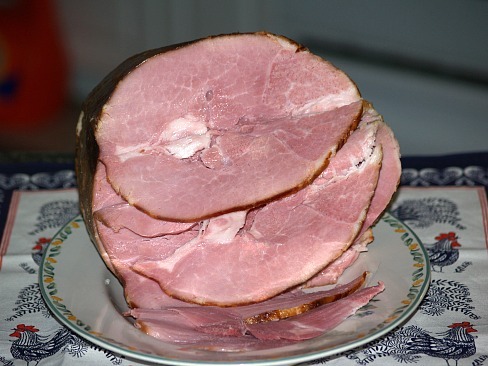 Country ham is uncooked, but cured and dried in some form and can be either smoked or unsmoked. This terminology is usually associated with Southern United States. Of these hams the Virginia ham has become very famous. Even more specific is the popularity of the Smithfield Ham which must originate from the Smithfield Virginia area. Other hams also come out of the Southern Appalachian area and are likely to include locally made honey in the curing. They can be salt cured or are hickory smoked. Part of knowing how to bake a ham is to know that whole country hams, because of the curing process, produce a distinctive flavor and texture which requires special treatment in the preparation. The surface of the ham is blackened and sometimes rusty looking along the edges. They must be scrubbed thoroughly and any rusty edges must be trimmed off. These hams must first be soaked for 12 to 24 hours covered with cold water; then the ham needs to be boiled. Place the skin side up in a large kettle, cover with boiling water and simmer, tightly covered, until tender. Allow 25 to 30 minutes per pound. You may ask, “Why all this trouble?” The flavor is well worth the effort. Some people would not have it any other way. When ready for baked ham recipes, follow cooking ham instructions. If glaze is desired, remove from oven 30 minutes early and apply glaze; then return to oven. The temperature and length of cooking time is determined by the size and weight of the ham. Check the ham cooking chart for guidance. Spread ham thinly with prepared mustard; then pack mustard with brown sugar. Baste ham with syrup made by cooking 1 cup honey with 1 cup brown sugar until sugar is dissolved. Mix juice of 2 oranges, ½ cup pineapple juice, ½ cup sugar, ½ cup white corn syrup or ½ cup honey; baste ham frequently with mixture. Make apricot puree by cooking 2 cups dried apricots with 2 ½ cups water until soft, rubbing through a sieve and adding 1 cup sugar; brush over the ham and use for basting. Heat 1 cup cherry juice with 1 cup honey; baste ham frequently. Mix 1 cup crushed pineapple with 1 cup brown sugar; brush over ham and use to baste. Place thin slices of unpeeled orange over ham and pour thick brown sugar syrup (1 ½ cups brown sugar plus ¾ cup water-bring to boil) over all. Baste ham with apple cider, pineapple juice, or prune juice. Place ham in large Dutch oven; add water 1 cup cranberry juice, 1 cup wine, 1 cup sugar, cinnamon sticks and cloves. Bring mixture to a boil; cover, reduce heat and simmer for 20 minutes then cool. Remove ham and marinade from pot and place in a large non-metal bowl. Cover bowl and refrigerate for at least 8 hours; turn one time. Remove ham from marinade; reserve 2 cups of the marinade and discard the rest. Place ham in a lightly greased shallow roasting pan; cover. Bake 1 ½ hours basting ham occasionally with reserved marinade. UNCOVER and bake an additional 15 minutes or until meat thermometer registers 140F degrees BASTING ham frequently with ham juices. Remove ham and reserve ham juices. Combine in a saucepan remaining 1 cup of cranberry juice, 1 cup wine and 1 cup brown sugar. Bring mixture to a boil, reduce heat and simmer 20 minutes; serve with ham slices. Wipe ham with damp paper towels. In a large bowl combine flour, ginger, cloves and salt; mix well. Gradually add 2 cups cold water mixing well with a fork. On a lightly floured board mold dough around top and side of ham until evenly covered. Place on a rack in a shallow roasting pan; insert meat thermometer away from the bone. Bake until internal temperature is 130F degrees about 2 hours. Combine glaze ingredients in a small saucepan; bring to a boil stirring. REDUCE HEAT: simmer uncovered stirring occasionally 40 to 60 minutes. (Should have 1 cup left). Remove pastry from ham and discard. Using a sharp trim off the skin; make diagonal cuts making a diamond pattern in the outside fat layer 1 ¼ inches apart. Place a whole clove in the center of each diamond; brush ham well with glaze. Bake 25 minutes brushing 2 more times; ham should be shiny and glazed. Learn how to bake a ham with the flavors of cranberry and orange! Slice skin from ham; score fat on ham in diamond shape design. Place ham fat side up on rack in shallow roasting pan. Bake for 3 to 3 ½ hours. TO MAKE GLAZE combine cranberries and water in medium saucepan; bring to a boil. Boil cranberries about 4 to 5 minutes until skins pop; press through a sieve. Combine flour, mustard and butter in the saucepan; stir in the cranberry juice. Stir into the pan mixture ½ CUP brown sugar, honey and vinegar; mix well. Bring to a boil and cool then 1 minute. Coat top and sides of ham with remaining 2 CUPS brown sugar. Arrange orange slices on ham; secure with tooth picks leaving tops exposed. Place a cherry half on each pick; pour hot cranberry mixture over ham. Bake another 60 minutes until thermometer reaches 140F degrees. NOTE: Baste ham every 15 minutes with pan juices the last 60 minutes. Learn how to bake a ham and how to make great ham leftovers like ham and beans. Ham and Beans can be made by soaking dry beans and cooking with ham. Green beans can also be made with the leftovers and produce a delicious flavored dish. Leftover honey baked ham recipe is great served with an added fruit sauce.